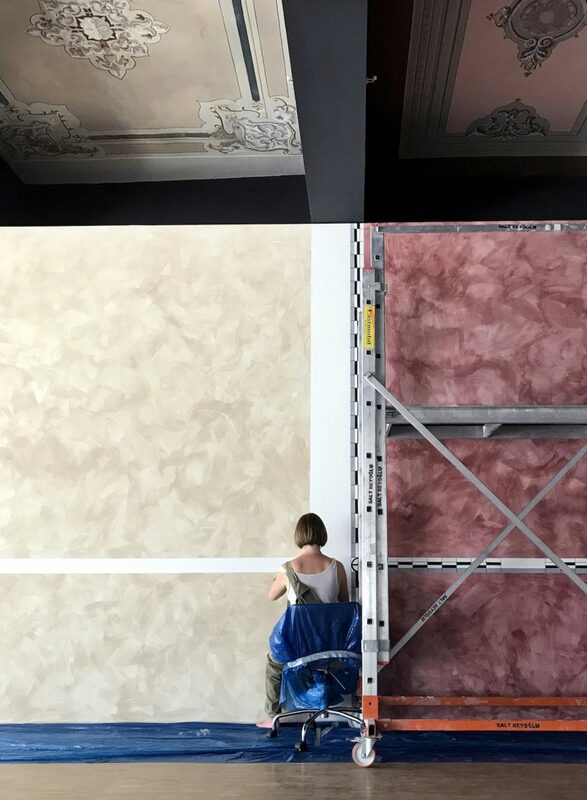 Scenes From A Pre-Crime (Performance for Security Guards) is a series of new site-specific murals on the 2nd and 3rd floors, and in the lobby of SALT Beyoğlu, Istanbul, commissioned on the occasion of The Universe Flickers, curated by Annie Fletcher. In this work, the artist responds to the 150 years-long history of Siniossoglou Apartment, today SALT Beyoğlu, by murals reminding the building’s original use of space as retail on street level and domestic residences on its upper floors. The work operates as both a performance and an intervention that the artist has developed within six weeks spent here. 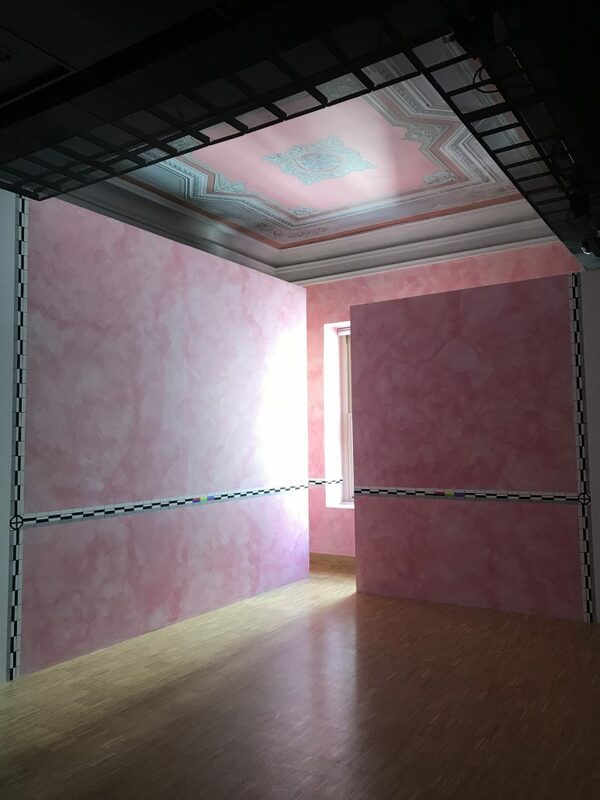 Referencing the existing ceiling paintings, Khan-Dossos’ light wash monochromatic murals reintroduce the domestic realm into the exhibition space, and proposes that the private domain can be just as much a place of crime or incident as the public space. The murals, beginning on the third floor and reaching down to Forum, are delineated with a forensic ruler described by the artist as, “a framing device or delineation of space, but also as a form of witnessing.” The ruler is painted into rather than placed above the surface, and becomes part of the wall element. Does this action of including the forensic ruler act as a preventative measure or a fatalistic gesture of what is bound to happen? Khan-Dossos’ physical occupation of the building acts as an abstract, provocative testimonial, marking her own performative presence today, and also pondering the site’s future potential. As the works were installed away from the public gaze, the artist dedicates the works to the security guards who were the witnesses of its progress but also showed great care and awareness of the process. The artists address the measures of our knowledge, the infidelity of testimony, as well as the corruptibility of history. Their practices, which are often influenced by the intellectual and critical impulses of feminism and queer theory, trouble the capacities and the limits of political representationalism. Boghiguian’s drawings and paintings operate as reflections on the geopolitical conditions in which her subjects live. Her images link antiquity, literature, myth, and poetry as she intends to describe the conditions of our current alienation. Hamadeh’s work is part of a long-term operatic project investigating the notion of testimonial in an attempt to disrupt the centrality of citizenship.